Known as the 'Pearl of the Carpathians' for its beautiful mountain scenery, the winter ski resort of Sinaia is nestled in the Prahova valley surrounded by the snow-covered peaks of the Bucegi Mountains, a stunning holiday retreat. It is also the setting for Peles Castle, a beautiful creation in the German-Renaissance style and considered to be one of the finest castles in Europe. With the construction of the castle as a summer residence for King Carol I, the little hamlet became an exclusive aristocratic resort and today is filled with holidaymakers who come to walk or ski in the mountains. The Sinaia ski resort has more than 20 ski slopes served by nine ski lifts. The longest ski slope is two and a half kilometres. The resort offers great skiing, for beginner, intermediate and expert skiers; there are six blue runs, four red and 11 black. The highest ski slope starts at an altitude of 6,500 feet (2,000m), while the lowest one starts off at 2,800 feet (850m) above sea level. Sinaia ski lifts operate from 8:45am until 4pm on every day of the week except Mondays. Ski equipment is available for renting at Sinaia for those that do not have their own equipment. Using the ski lifts costs two euro and skiers have to purchase all their tickets at the start of their day on the slopes. The resort also boasts other attractions such as a 17th-century monastery with original frescoes, and the small Pelisor Palace. Sinaia offers excellent high-altitude skiing opportunities, situated at an elevation of 6,500 feet (2,000m). The slopes can be accessed from town via a cable car to Cota 1400, and then by cable car or chairlift to Cota 2000. The pistes at Sinaia are located on two sides of the mountain, with the most difficult (and spectacular) slopes on the east side toward the city. The west side, facing Sun Valley, has runs well-suited to beginner and intermediate skiers. Sun Valley also has some good cross-country skiing trails, originating from the Dorului Hut at the end of the chairlift line. The ski season in Sinaia starts in December and can last until May, though snow is often unreliable toward the end of the season. Shopping in Sinaia is limited to a selection of handicraft, jewelry, souvenir and clothing stores. The town has a selection of open air markets where tourists and holidaymakers can shop for mementos and trinkets. For visitors taking a break from the slopes, head to the Monastery Open Air Market, the Peles Castle Marketplace or the Democracy Market, which all sell a selection of handmade goods, souvenirs, postcards and artisan objects. The town also has a number of food markets, such as Unirii Market and the Monastery Open Air Market, which are great for photographic opportunities or a quick snack. Shoppers can also choose from the small boutique shops scattered throughout the town. Sinaia has a selection of restaurants ready to cater to the many skiers and sightseeing visitors to the town. Most of the restaurants are concentrated in the central area of the town, although there are one or two eateries a short walk from the centre. Bistro La Teleferic is great for a warm meal after a day on the ski slopes while the unique Forest Restaurant cascades down the hill behind the Ioana Hotel. Cucina Sofia offers excellent Italian food, while Taverna Sarbului has a great selection of local Romanian cuisine. Nightlife in Sinaia tends to be concentrated around Casino Maxim. The Casino was built 1912 and designed by architect Peter Antonescu. It has a selection of gambling facilities as well as a bar. There are also a couple of pubs in the centre of town. Visitors can drop in at the Old Nick Pub for a post-slopes drink or the Irish House for a Guinness. The main street through the centre of town also has a selection of nightclubs and late night drinking spots. Sinaia offers visitors a great selection of things to do and places to see. Perhaps the first item on many lists of things to do in Sinaia is skiing, the town offers inexpensive skiing on a selection of ski slopes surrounding the picturesque town. However there are many other attractions and activities on offer in Sinaia. The most popular tourist sight in Sanaia is the spectacular Peles Castle and the Pelisor Palace just beyond the castle. 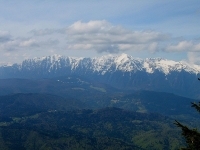 The Bucegi mountains are also popular and a short trip from the town. Sinaia is a picturesque town to wander through and the Sinaia Monastery behind the Orthodox Church has a small museum displaying some of the towns treasures, including a beautiful 1668 bible translated into Romanian using the Cyrillic alphabet. One of the only negatives associated with Sinaia is related to skiing. The Sinaia ski resort still uses an antiquated and impractical method of paying for ski passes. Visitors must buy all their tickets at the beginning of the day and hand in one ticket each time they use a ski lift. This involves guessing how many times you will use the ski lifts in one day. Also, keep in mind the ski resort does not offer as many modern conveniences as those in Western Europe.